OSHA requires a daily inspection of each lift truck you operate. To see what OSHA expects of your inspections, visit their eTool HERE. While OSHA requires that each be inspected, they do not give specifics on how to, or what to inspect. We will provide you with some specific areas to inspect to be sure you are doing all you can to be certain your forks and chains are in safe operating order. Your forklift chains and forks lift and lower hundreds of thousands of pounds each shift and slight wear on either could result in a load of thousands of pounds come crashing to the ground and anything in its path will be in harm’s way. We will address the why’s, how-to’s and when’s with regards to inspection of these parts and give you more confidence that these parts are operating safety and efficiently in your fleet. When it comes to load handling it all starts with the forks. Forks carry the weight of each load from lift to lower and failure can result in product loss, injury or even death. There are several points of inspection for forks and chains. Fork Inspection - OSHA does not require specific knowledge of metallurgy or the equivalent to perform inspections. They do however require that they be inspected for safe functioning. Following are areas that you should pay particularly close attention to when inspecting your forks. Rated load capacity – Are the forks you are using rated to carry the loads they are handling? If you’re not sure, you need to be. Surface cracks – Inspect each fork top and bottom for surface cracks. Pay close attention to the heel area and the welds to the areas that attach the forks to your lift truck. These are areas that are more likely to develop cracks. If a crack is found, it must be replaced before the lift truck can be put back into service. Repair of a damaged fork is not permitted. Straightness of the blade and shank – If either the shank or the blade has any sort of bend, the fork needs to be replaced before the lift truck is put back into service. Excessive angle - If the shank and blade angle exceeds 93 degrees, the fork needs to be replaced. 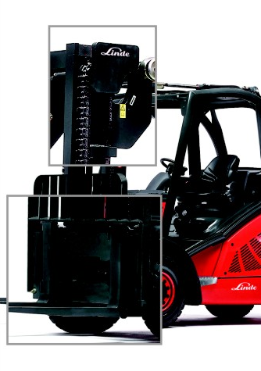 Positioning lock – If the positioning lock is inoperable, it must be replaced before the fork is put back into service on the lift truck. Normal wear – Use calipers to measure the heel and the blade for wear. These are the areas that wear more quickly. Once a fork wear reaches 10%, the fork must be replaced. 10% wear results in a 20% reduction in rated fork capacity and represents a significant exposure for accident. Chain elongation – Elongation of more than 3% should be replaced as this represents an approximately 15% reduction in strength. Rust and corrosion – Any rust or corrosion needs to result in chain replacement as this causes cracking and significant reduction in strength. For maximum protection your chains must always be protected by a complete coating of lubricant. Plate cracking – Inspect closely for cracks. Any cracks discovered means the chain is due to be replaced and should be done before the forklift is put back into service. Protruding or turned pins – A lack of lubricant results in friction between the plates and the pins causing the pins to twist and turn their way out of place, resulting in chain failure. Misalignment – Look for wear patterns on pinheads or outside plates. Continued operation will result damage to the chain and sheaves and can result in chain failure. Chain anchors and sheaves – Inspect anchors for misalignment , damage or undue wear. Anchors with worn or broken fingers must be replaced. Forks and chains have many opportunities to fail and it is up to you to be certain that they do not. We strive to assist you in staying in compliance with OSHA regulations, but more importantly help you maintain forklifts and employees that are safe and productive. Matthai Material Handling inspects thousands of forklifts each year and we would be glad to assist you in inspecting your forks and chains. As forklift service professionals we can perform these inspections quickly and thoroughly, and assist you in teaching your operators effective inspection techniques. Give us a call at 410-344-1801 to set up an appointment.